Pom poms are definitely the hottest summer trend at the moment! We are seeing them everywhere from runways and street wear to home decor and party decorations. You can see them dangling on wall hangings, decorating summery espadrilles and hanging on colorful earrings. But did you know you can easily perfect the art of the pom pom, too? Let the pom pom takeover begin! Join us for Ultimate Pom Pom Experience where you will learn all the techniques and tricks to making the perfect pom poms and tassels. Our talented JamMaster Marisa, blogger behind the playful DIY and lifestyle site The Neon Tea Party, will give you a full rundown on how to make these fluffy and cute accessories that can be applied in so many different ways. This class is beginner-friendly; no experience necessary! And we’ve got all the materials you’ll need, including Loome tools for pom pom making and a selection of fun colored yarns. You will learn different methods for stranding and hanging your creations into garlands, mobiles, or wall-hangings. 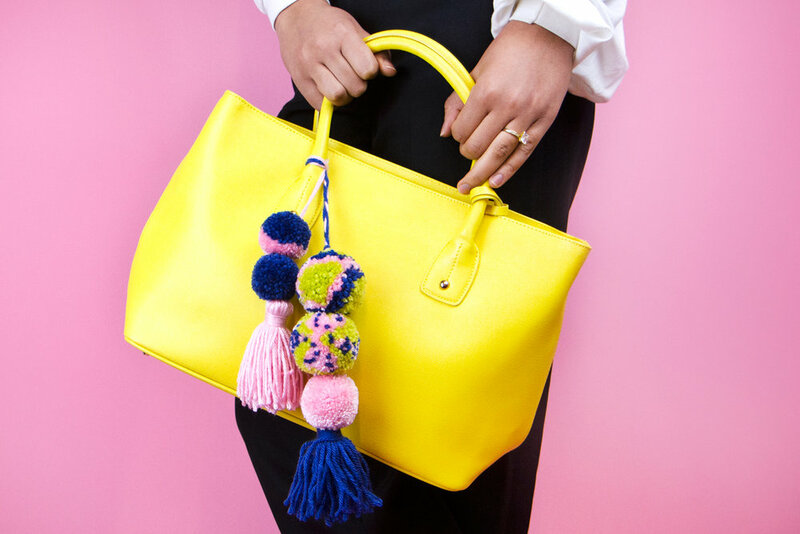 Walk home with the coolest pom pom bag charm!